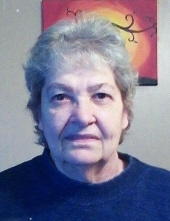 Marjorie (Lowman) Hartley, 76, of Parks Township passed away December 23, 2018. She was born July 2, 1942 and the daughter of the late Anne Miller Lowman and Ben Lowman. Marge worked at the Florist Department in Foodland and Pugliese Flowers in Vandergrift and was a member of the Freeport VFW #6648 and the Freeport Eagles #1732. Marge enjoyed solving crossword puzzles, cross stitching and going on Facebook but her true passion was spending time with her family and friends. She is survived by her son Richard Westendorf of Parks Township, a daughter Cynthia Reichenbaugh of Vandergrift, a sister Alice Powell of Vandergrift, and three grandchildren; Derek Westendorf, Candi Reichenbaugh, and Rachel Reichenbaugh, and several nieces and nephews. In addition to her parents she is preceded in death by her husband Nick Hartley, a sister Evelyn Plavetzky and two brother in-laws Andrew Plavetzky and Albert Powell. Family and Friends will be received on December 27, 2018 from 12:00 pm to 3:00 pm with a service at 3:00 pm at The Janette L. Gamble Funeral Home Inc. 2842 River Road Vandergrift, Pa (724) 567-7006 with Pastor Lee Rupert officiating. Online condolences may be made at Gamblefh.com. To send flowers or a remembrance gift to the family of Marjorie (Lowman) Hartley, please visit our Tribute Store. Family and Friends will be received on December 27, 2018 from 12:00 pm to 3:00 pm at The Janette L. Gamble Funeral Home Inc. 2842 River Road Vandergrift, Pa (724) 567-7006. Family and Friends will be received on December 27, 2018 at 3:00 pm for a service at The Janette L. Gamble Funeral Home Inc. 2842 River Road Vandergrift, Pa (724) 567-7006 with Pastor Lee Rupert officiating. "Email Address" would like to share the life celebration of Marjorie (Lowman) Hartley. Click on the "link" to go to share a favorite memory or leave a condolence message for the family.